Testament of an incredible destination is often how many guests return time and time again. 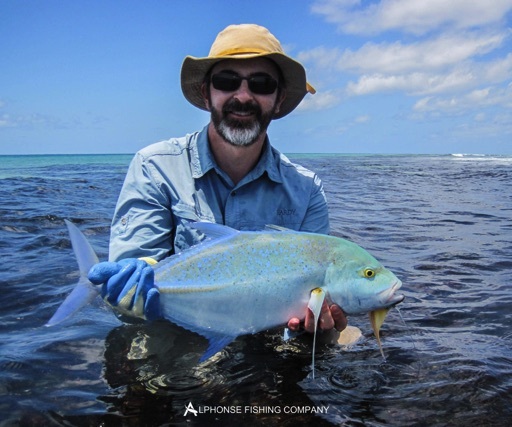 This week we welcomed back several anglers who have been coming to Alphonse Island for many years. When we have groups like this it generally means business and the fish have to look out. Beautiful weather on the horizon and a full moon rising later in the week was a combination sure to produce great tides and spectacular conditions. 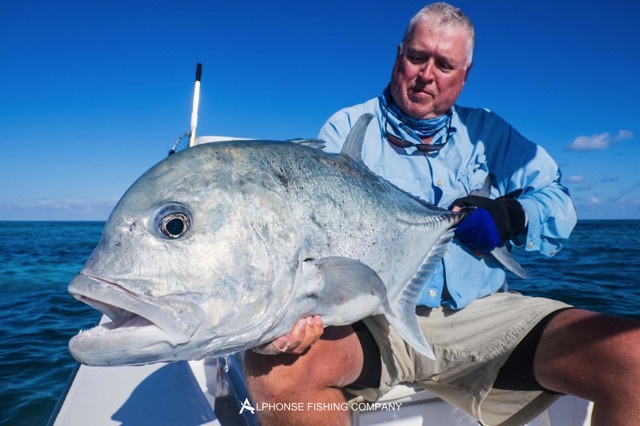 The week produced lots of great fish for everyone that ventured out onto the St Francois flats. 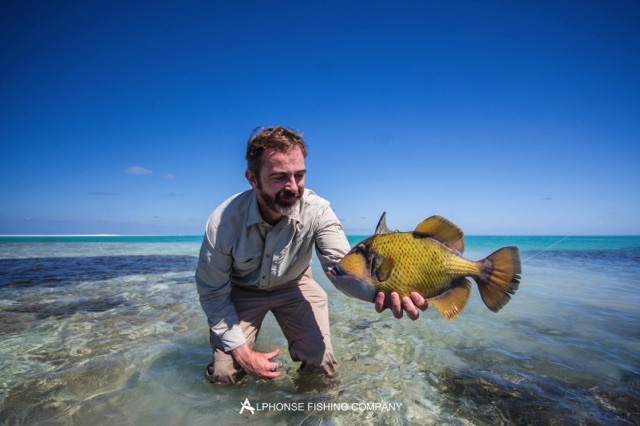 Last week’s triggerfish bonanza was not over and the anglers went on to land four yellowmargin and two Moustache triggers. Charlie Limond was first to get his week off to a great start by landing a moustache and yellowmargin on day one. All he needed was the picasso and a trigger slam would’ve been completed. 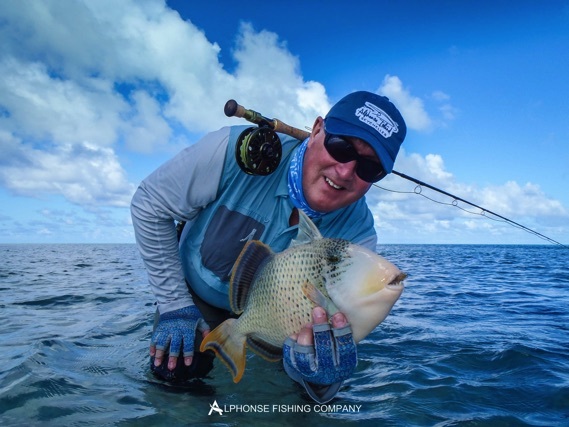 Often times picasso triggerfish are overlooked on the flats but in this instance Charlie would’ve been very happy to find one but couldn’t. 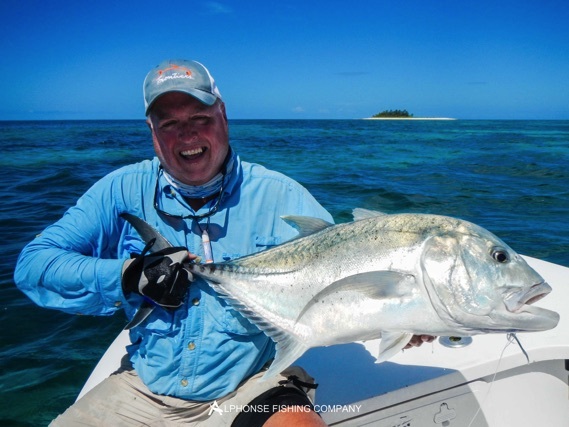 Richard Moss also kicked off his week very nicely with a fin perfect 70cm GT. 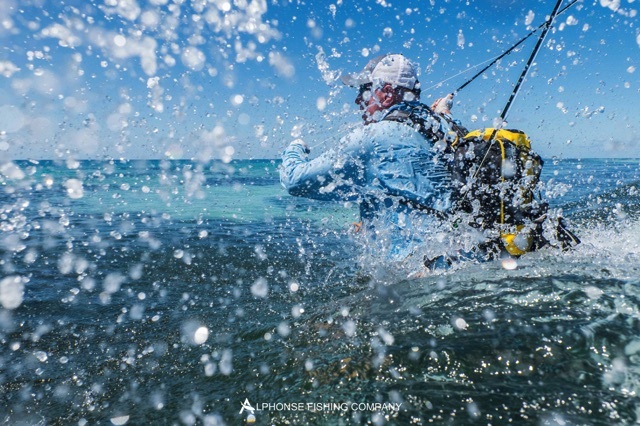 Hakan Undins got everything right on day 3, when he managed an incredible “Flats Grand Slam”, a gorgeous yellowmargin trigger, an 83cm GT and a hand full of bonefish. 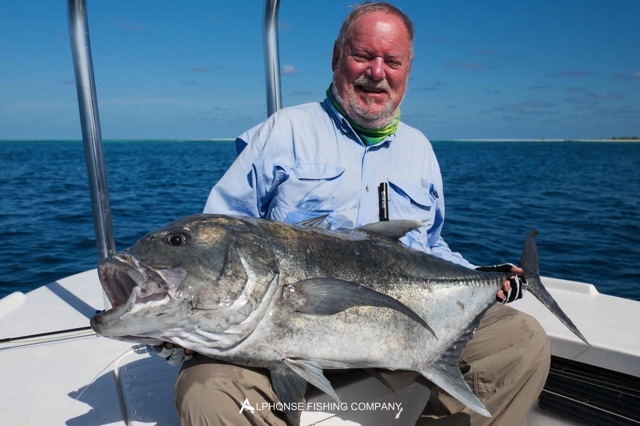 Hakan’s boat partner Tim Markham unfortunately also lost a “Flats Grand Slam” of fish that same day but made up for it later in the week by landing a beautiful moustache triggerfish. Charlie continued to catch fish and finished the week with three triggers whilst Hakan added a second yellowmargin to his total. 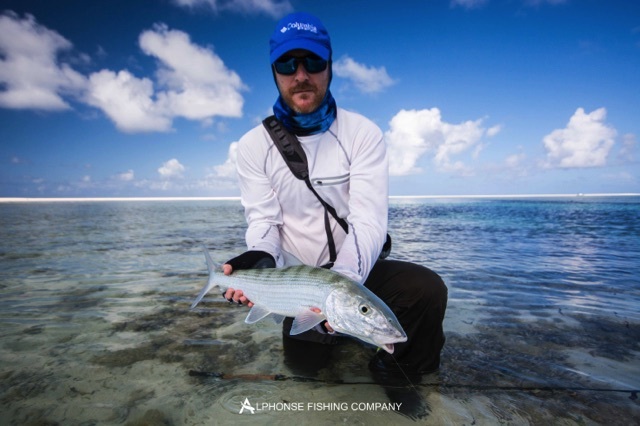 Bob Artzberger flew in from Astove and adapted nicely to the waters around St Francois atoll as he managed to bring two great GT’s to hand. However the only member of our prestigious hundred cm club this week was Geoffrey Paradise, he just broke the mark with a 100cm fish. 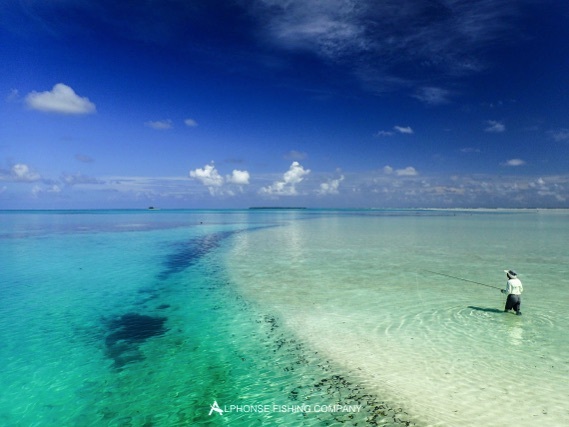 When you visit a place like Alphonse Island, there are some things that you just have to do. 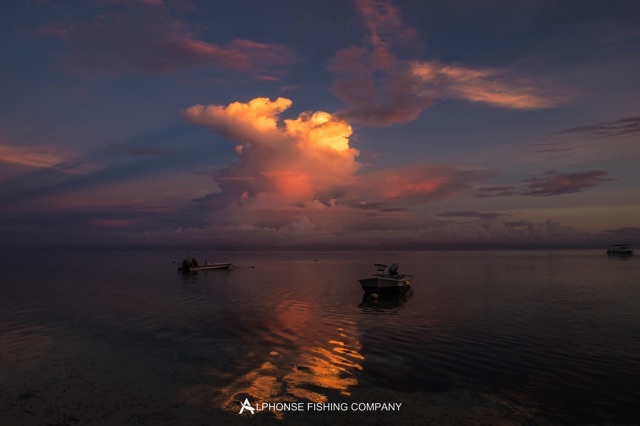 Father and son Richard and Paul Smith decided to take advantage of the great bluewater fishing that Alphonse has to offer by taking the chance to go in search of sailfish. 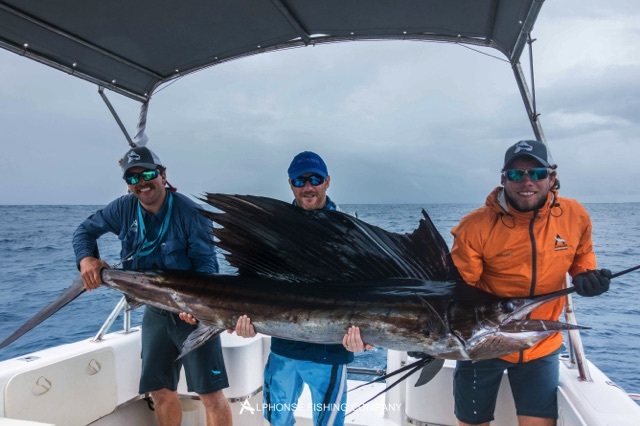 After a few came up Paul managed to set the hook, jump and bill his first ever sailfish on fly. He then went on to complete his “Bills and Bones Slam” by messing with a few single tailing fish on the flats. Another great week of fishing with some old faces as well as some new ones.